Sometimes we do receive reports that the application crashes randomly. Most of the time this is not caused by a fault in the application, but usually due to 'out of memory' errors. Especially with larger projects. Of course you should always check first if there is a newer version of the software, so you have the most stable version available. If there any known problems we always fix them as soon as possible! Your computer might have plenty of physical memory, but there are other limitations you need to be aware of. First note that WYSIWYG Web Builder is a 32 bits application, so it cannot use more than of your system's 2GB of memory (application+project+extensions+images etc). And although this should be enough even for larger projects (hundreds of pages), it is important to keep the size of your images a small as possible. 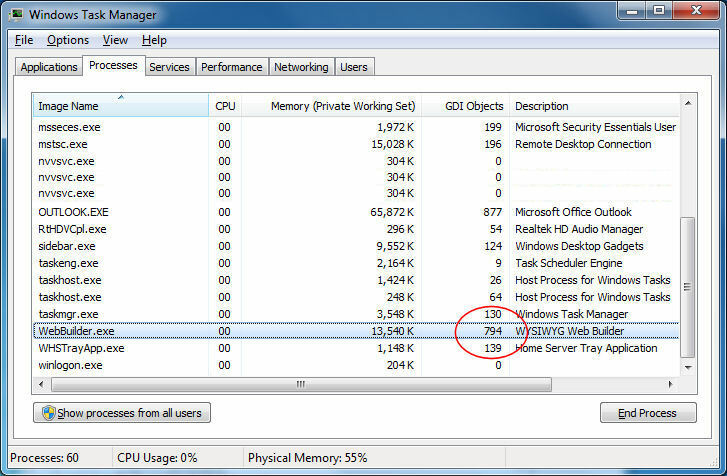 Using very large images (without resizing them first) may eat up a lot of your system's memory! Also Windows limits the number of graphics objects (GDI handles) used by a single application. The default value is 10.000, although this may be lower depending on your system settings. Also keep in mind that the software itself also uses some of the GDI handles for the user interface! 1) Keep the number of used objects within a reasonable limit. If your project contains thousands of objects then you probably should consider redesigning the layout (tip: use master pages). 3) Use master pages so you do not have to use multiple instances of the same image. Put all common objects on a master page, this can greatly reduce the number of used system resources. 4) Publish one page or a smaller number of pages at a time. The publish windows has several options to publish specific pages only. For example: 'Publish page currently opened'. 5) Do not install and use too many extensions. Although it may be tempting to use lots of extensions in your project (because they are so cool), extensions are like separate applications. So let's say you use 100 extensions, that will be like having 100 applications running on your computer! 6) Reduce the number of pages opened in the workspace. If you open a page then Web Builder will have to load all images (and other assets) in order to display them. Web Builder will only allocate memory for the pages you have opened in the workspace. 7) You can also increase default per-process limit of GDI handles. Finally we like to note that Web Builder can automatically make safety backups, so in most cases you will not lose any of your work during a crash. Re: WYSIWYG Web Builder crashes... what can I do? If WWB crashes even in smaller projects then there might be a bug in the software that we are unaware of. Next try to see if you can reproduce the same problem in a new project. If yes, then let us know the exact steps to duplicate the error and we will try to fix it as soon as possible. If no, then it may be something specific to your project. In that case please share your project with us so we can use it to fix the problem. But please always include as much details as possible, we can only fix a problem if we know how to reproduce it. We have released a 64bit version of WYSIWYG Web Builder, which does not have a memory limit. So, it can handle larger projects.